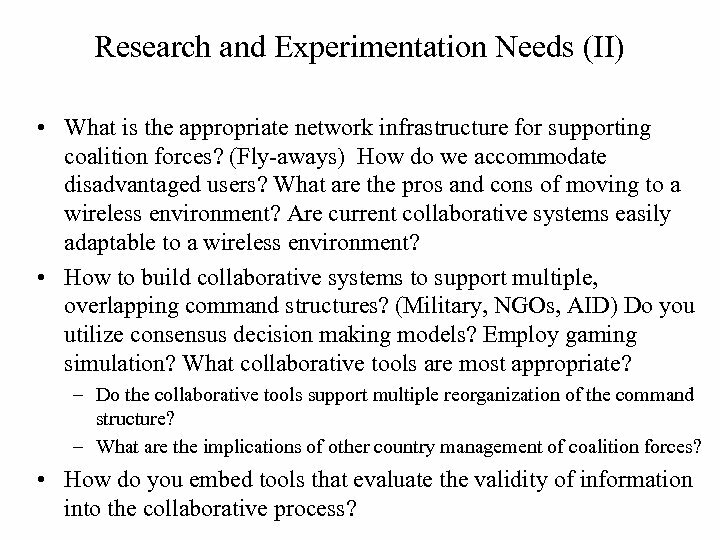 Research and Experimentation Needs (II) • What is the appropriate network infrastructure for supporting coalition forces? (Fly-aways) How do we accommodate disadvantaged users? What are the pros and cons of moving to a wireless environment? Are current collaborative systems easily adaptable to a wireless environment? • How to build collaborative systems to support multiple, overlapping command structures? 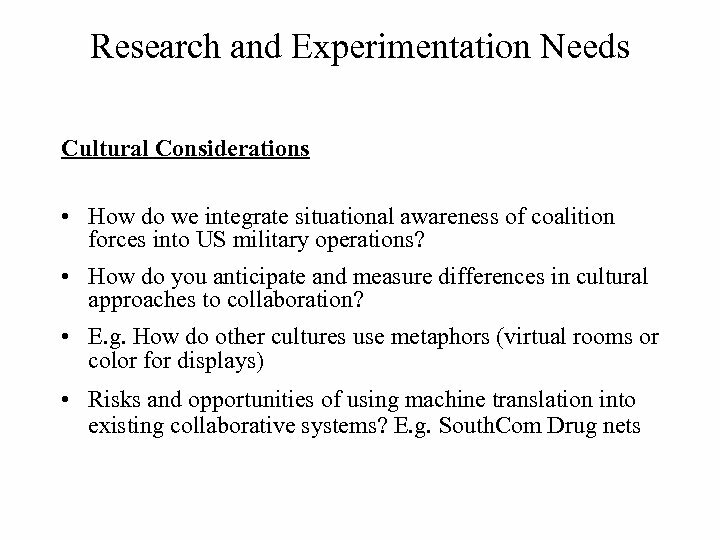 (Military, NGOs, AID) Do you utilize consensus decision making models? Employ gaming simulation? What collaborative tools are most appropriate? 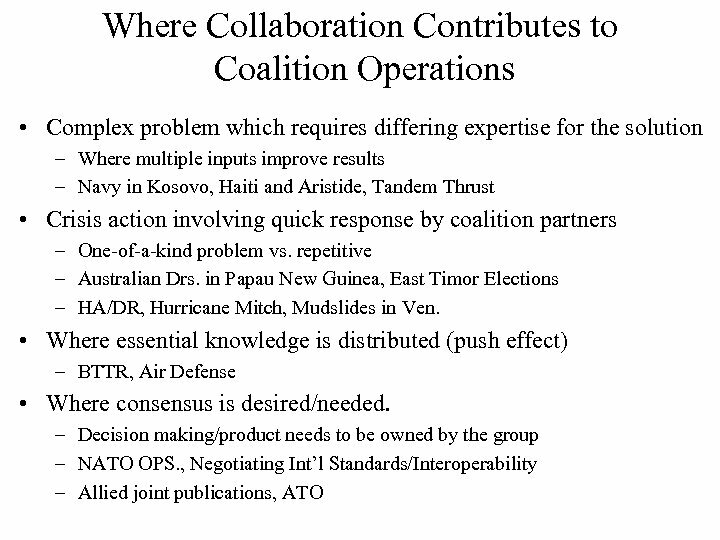 – Do the collaborative tools support multiple reorganization of the command structure? 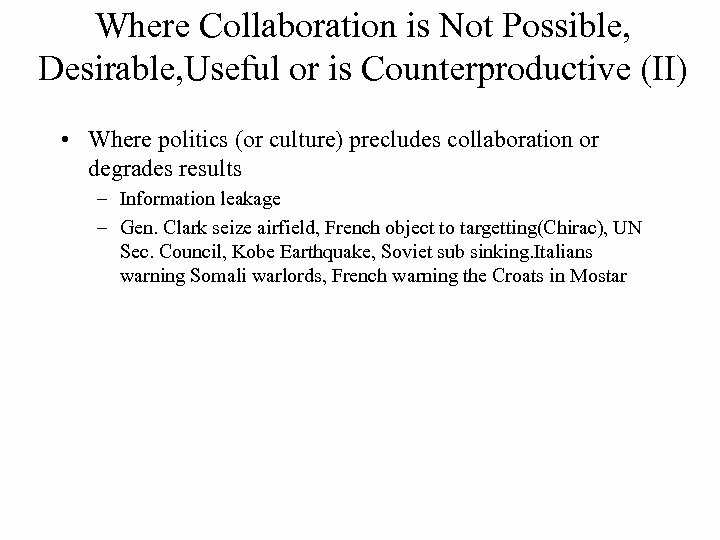 – What are the implications of other country management of coalition forces? • How do you embed tools that evaluate the validity of information into the collaborative process? 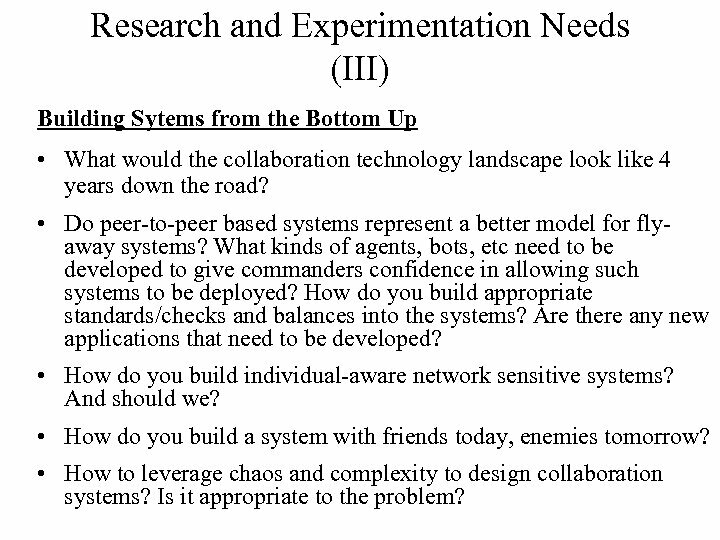 Research and Experimentation Needs (III) Building Sytems from the Bottom Up • What would the collaboration technology landscape look like 4 years down the road? • Do peer-to-peer based systems represent a better model for flyaway systems? What kinds of agents, bots, etc need to be developed to give commanders confidence in allowing such systems to be deployed? How do you build appropriate standards/checks and balances into the systems? Are there any new applications that need to be developed? • How do you build individual-aware network sensitive systems? And should we? • How do you build a system with friends today, enemies tomorrow? 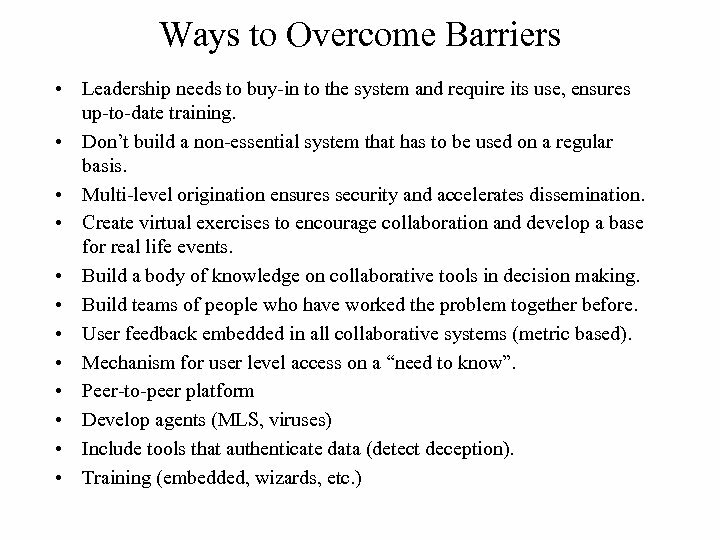 • How to leverage chaos and complexity to design collaboration systems? Is it appropriate to the problem? 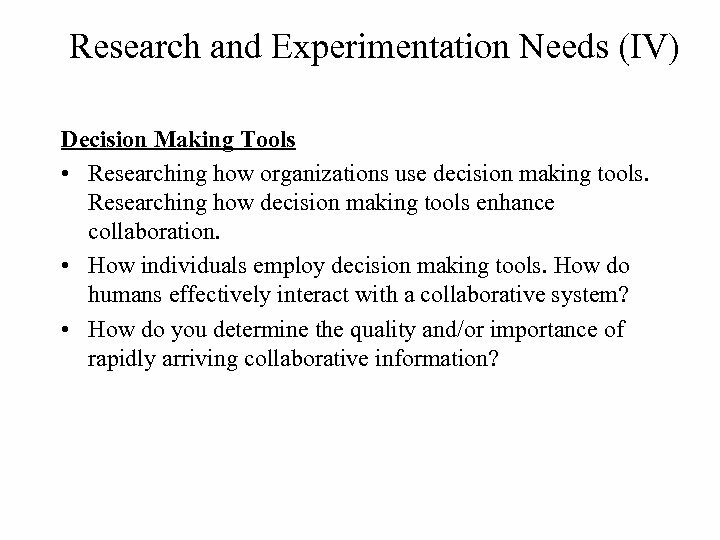 Research and Experimentation Needs (IV) Decision Making Tools • Researching how organizations use decision making tools. Researching how decision making tools enhance collaboration. • How individuals employ decision making tools. How do humans effectively interact with a collaborative system? 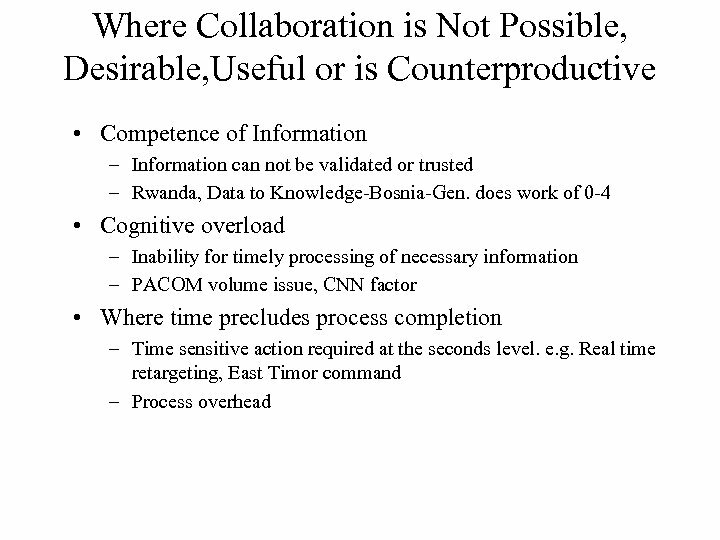 • How do you determine the quality and/or importance of rapidly arriving collaborative information?